The Listowel and Ballybunion Railway opened in County Kerry in Ireland in 1888 and closed in 1924. It was steam-hauled and, as you might imagine if you know the area, largely rural. Nothing particularly unusual about it. Oh, except it looked like this. 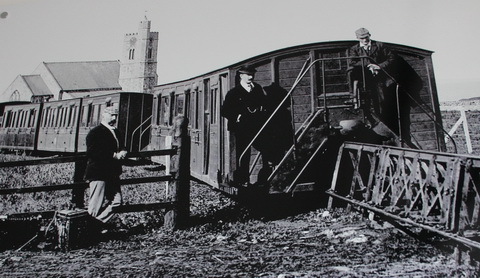 The Listowel and Ballybunion, you see, was a rare example of a Lartigue monorail. M. Charles Lartigue was inspired by seeing camels carrying loads in panniers and thought, “I know, that’s the perfect basis for a railway.” Basically, in the Algerian desert, it was difficult to build railways due to the problems of loose sand and uneven ground. Lartigue’s monorail elevated the line above the ground, keeping it clear and level. Monorails are theoretically cheaper than regular railways, hence the interest in replicating the concept in Kerry, an area not noted for its desert landscape. In so doing, the L&BR gave Ireland its first three-wheeled locomotives. 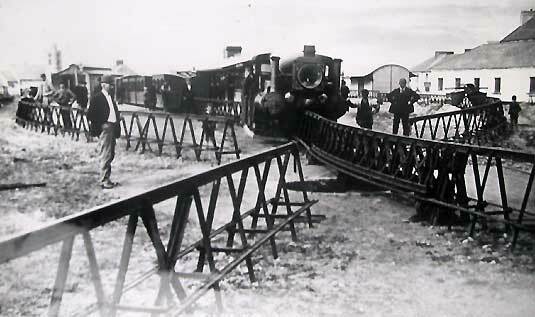 The other problem was that the track was raised off the ground, turning it into a barrier wherever it went. Instead of level crossings, therefore, roads had to cross the line by means of drawbridges. A novel solution to getting passengers across the line was to build special wagons that I can only call “footbridge cars.” Literally, wagons that held stairs over the line. Incredibly, a section of this line has been rebuilt with a (sadly diesel-powered) replica train. The link is below. Go see them if you’re in the area. Look at the spare tyre on that one! Emett a loss to describe this.